One of your challenges as a family caregiver is making sure that your senior loved one gets a balanced, satisfying, and healthy diet on a regular basis. Simply because you want your parent to eat a healthy diet does not mean that they cannot continue to enjoy their favorite flavors and foods. February 9 is National Pizza Day. This is a fantastic opportunity for you to explore healthy ways that your parent can still enjoy this family favorite meal without sacrificing the quality of their diet as they age in place. Making a pizza together is also a wonderful way to stimulate their mind, support memory skills, and create memories that you can treasure well into the future. • Try whole wheat crust. Swapping a whole wheat crust for your classic white crust provides extra fiber as well as important vitamins and minerals. It also adds a nutty, earthy flavor that is a perfect complement to a wide variety of toppings. • Try a cauliflower crust. If you are trying to steer clear of too many carbohydrates, someone in your family is intolerant to gluten, or you have been looking for ways to sneak more vegetables into your family’s diet, try making a cauliflower crust. Using this sturdy vegetable produces a crust that is ideal for absorbing flavors and providing vitamins, minerals, and fiber with very low calories and carbs. • Pack the sauce with veggies. 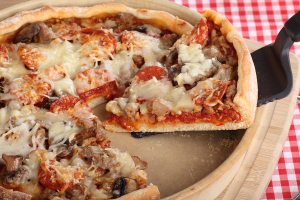 When you make your own pizza you do not have to settle for plain tomato sauce. Fill your pizza with extra nutrition by packing the sauce with veggies. Try cooking carrots, onions, garlic, and zucchini in a small amount of olive oil until they are soft and fragrant then add them to the classic sauce and puree the sauce until smooth. Add extra seasonings and spices for a robust flavor. • Load up the toppings. The best part of pizza is customizing the toppings, and this is a great way for you to make your meal healthier. Choose a lower fat option for the cheese and then load up with vegetable toppings. If your family likes meat toppings, add these in smaller amounts along with the veggies such as onions, peppers, olives, and tomatoes. Starting senior care for your aging loved one can be one of the most meaningful, compassionate, and effective decisions that you can make for your senior parent throughout the course of your caregiver journey with them. A senior home care services provider can be with your aging parent on a customized schedule that takes into consideration not just their individual challenges, needs, and limitations, but also their lifestyle goals, personality, and the amount and type of care that you are able to give them. This means that they can stay safe, healthy, comfortable, and happy throughout their later years while also maintaining as much independence, autonomy, activity, and fulfillment as possible. When it comes to stimulating their mind and supporting a healthy lifestyle including a better diet, this care provider can plan activities that coordinate with their goals, opinions, lifestyle goals, and preferences so that they can enjoy doing them together and gain the most benefit from an active, engaged, and stimulating lifestyle as they age in place. For Senior Care Services in Millington TN, please contact the caring staff at Personal Care Services MidSouth today! This entry was posted in Senior Care Millington TN and tagged Senior Care Millington TN. Bookmark the permalink.